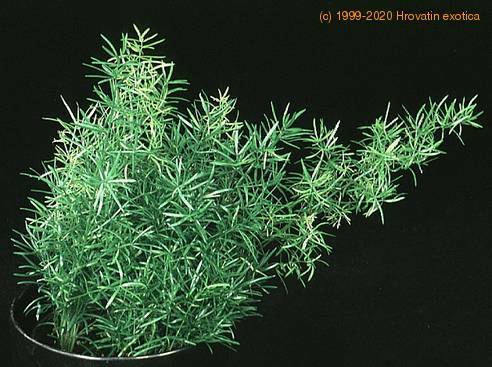 Use Flower Servant and it will remind you when to water, mist, fertilize or repot Asparagus densiflorus. Click here and try for free! This evergreen arching perennial has feathery, needle-like, stems giving an open, loose appearance in growth. In summer the plant has small white flowers that are followed by bright red berries. The plant can grow 24 to 36 inches (60-85 cm) in height and to a width of 3 to 4 feet (90-120 cm). It will grow in sun or even fairly dense shade, however, it would prefer some shade to maintain a darker green colour leaf. Bright sun tends to wash out the colour leaving a more yellow plant. Asparagus need good drainage. Move it to sunnier location if plant begins to thin. Fertilize in spring. Remove longest stems to maintain pleasing shape and cut out old shoots. Eating of berries may cause gastrointestinal problems. Skin irritation with redness, swelling, and blisters following contact with sap.